I finally decided to leave Facebook. I won’t lie, that was not an easy decision. In fact, it was really hard. See, Facebook is the only place where all my friends are together. Leaving Facebook is not just quitting a website, but it also means saying goodbye to all my friends. I am afraid I will no longer be invited to birthday parties, see cute pictures of their babies, or be able to find out that they have graduated and congratulate them. But I have also seen Facebook slowly change over the years, for the worse, a decline that is beautifully documented by the Electronic Frontier Foundation. There are many good reasons why you might want to consider leaving Facebook. One of them is that Mark Zuckerberg, Facebook’s CEO, apparently says that he “doesn’t believe in privacy”. Well, he just happens to be the guy who is in charge of the website where I hang out pretty much all the time with my friends. I compare this to being invited to a house party with all my friends, but where the owner secretly records everything we do and say, and tries hard to sell it to advertisers. When he gets caught, we rage, and he says “oops, sorry”. Again and again, like an abusive partner, he promises to clean up his act. At what point do we say “enough is enough”? Should we trust him never to do it again? Not if it is clearly against his financial interest. Why not leave? Facebook effectively holds our friends as hostages. The ransom is not our privacy, but our freedom. Let me explain: I do have (some) privacy on Facebook. Most of my information on Facebook was not exactly secret. The problem is not privacy: it is not being in control of your own life. 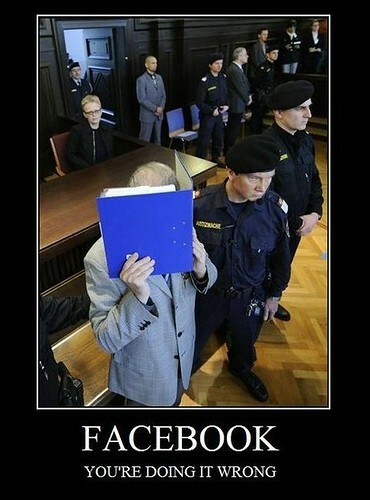 Facebook might give us privacy, but always on their terms. They make it incredibly hard to leave. They make it almost impossible to save your messages, photos and profile. We are talking about them refusing to give back our information, our photos, /our/ life! It is almost impossible to leave, so we stay and they will continue to take whatever privacy they feel they can get away with. How much do they feel they can get away with? Let me ask you: how much privacy are our friends worth to us? Dear Facebook, freedom or friends? That’s not a choice. So I quit. Instead, I plan to write on this blog, twitter, and longer e-mails to friends. It will not be a perfect replacement, but it will have to do until a better option comes along (psst there was life before Facebook!). Allow me to make a wild analogy, one I believe is not entirely out of left field. Many people know that there is censorship in China. Many people also tell me that 1) the poor Chinese must feel really repressed or 2) they must be okay with it. But if that’s the case, who in their right mind can be okay with censorship? They must be brainwashed. Ask yourself this: if I decide not to leave Facebook, yet I know they do not care at all about my privacy, what does that mean? How is that different from the people who continue to use the internet in China day in day out despite the prevalent and prolific practices of censorship? This is not a rhetorical question. Of course I realize Facebook is not the Chinese government, but I do think there are similarities between them, in kind although perhaps not in degree. Are you still on Facebook, and if so, why? This entry was posted in censorship, communication, emancipation, new media and tagged facebook, facebook fail, privacy. Bookmark the permalink. what are the chances that twitter will ‘walk’ a similar path as facebook. all business models has to generate revenue at the end. that’s a good question. although facebook and twitter are very similar at first sight, there is an important difference as well. twitter always has been public, and never has been private. in contrast, facebook promised that everything is private but now is going against their word. true, you can make your tweets private, but that’s only a small number of people. privacy settings in twitter are also very easy, unlike facebook. twitter also has an open api: other programs can tap into it (hence the many different twitter clients), which also makes it easy to retrieve your data. facebook is closed. it is impossible to touch your own data. i also suspect that if they would ever monetize, they do it through search, rather than through selling information to advertisers. i think what is important here are different promises and expectations. twitter never said: “tell us everything about yourself, you can trust us”. facebook did promise that but is no longer living up to it. the only reason why people are not massively going away is because all our friends are on it. some feel the “trade-off” is worth it; i believe otherwise. some might think it is not worth it, but that they cannot afford to leave. this is a collective action failure: everybody would leave if everybody else would leave, but nobody leaves because nobody leaves. so maybe one individual can make a difference (or not). in any case, i had enough. I think that’s a good point that you made, about how they would most likely monetize through allowing search, as opposed to selling info. And Lokhin’s made a good point too. Well, unfortunately, since the entire world has started FBing, a lot of ppl have abandoned their blogs, stopped using email, etc. There are few open-source alternatives being developed: Diaspora, Appleseed, Pip.io which offer privacy, and some are non-profit efforts…. all each of us needs is a critical mass of friends ‘migrating’ to the new social network, and communities/relationships could be reconstituted in no time, leaving facebook in the dust.